Since the foundation of the European Handball Federation back in 1991, the development of handball across Europe has been at the core of the federation’s mission. Through the sharing and transfer of knowledge and expertise, material aid and financial support the EHF has sought to raise the standard of the game across the continent and to eliminate the handball ‘blind spots’. Within the EHF, it is the Methods Commission that is responsible for overseeing the technical and development support made available to member nations in order to stimulate growth and raise the profile of the sport. Elected in June 2012 at the EHF Congress in Monaco for the next four year period, the man charged with development on the Methods Commission is Pedro Sequeira (pictured right) from Portugal. With a strong background in handball including 15 years as a player and 10 as a top-level coach in Portugal, as well as a professional career as a university lecturer in sport and physical education, Sequeira is well-placed to take on the role, especially as he also has the same remit within the Portuguese Handball Federation. The EHF supports nations and the development of the sport with a range of initiatives, from short-term one-off support to more structured, longer term projects including SMART, Foster and Infrastructure Support (ISP). He sees the key pillars of his work as education, of coaches, referees and managers; providing resources including publications, videos and manuals and also the provision of materials such as ball and goals. But new ideas are also being discussed by the EHF Methods Commission, including the further development of the EHF website to provide a platform for coaches and teachers to access the tools they require. At a university level too, the Methods Commission is keen to stimulate more research, through the support for specific scientific projects through the member federations and the organisation of the EHF Scientific Conference in November 2013. A key programme for the EHF is the SMART Project, which has seen the provision of technical expertise, materials and financial support over a three-year period, aimed in the main at youth handball, though projects such as beach handball and wheelchair handball have also been supported. These three year programmes are designed to have specific objectives and target groups, to support the development of handball through courses, provision of handballs, goals and literature. Since its launch in 2001, 20 projects have been supported across 15 countries. Launched in 2007, the Foster Project aims to establish cooperation between nations where handball is established and emerging nations. The EHF tries to encourage the more developed handball federations to adopt an emerging handball nation. These federations then received support and assistance, also from the EHF, based on a mutual agreement, and for a certain period of time. The idea is to establish a well-functioning system adapted to the needs and preconditions of the respective national federations by nomination of lecturers to courses, inviting teams to competitions, inviting participants to national courses, exchanging publications and materials, exchanging technical documentation and allowing a look behind the science of successful handball management (coaches and referees education as well as national development programmes). A total of 14 foster cooperation agreements have been concluded so far, including Spain and Italy, Croatia and Israel and Ireland with Denmark. The most ambitious programme to date has been the Infrastructure Support Programme or ISP, which was introduced from mid-2010 and sees not only the provision of material support but also investment from the EHF in building capacity in member federations. The basic idea is the part funding (together with national authorities) of salaries of full-time or part-time staff members, mainly development officers, hired by the national federation for the management of grassroots and development projects. The project expands over a period of three years and has long-term aims, each programme is tailored to the particular needs and culture of the member federation. Five ISP projects are now being supported by the EHF including Ireland and Scotland, the very first nations to sign up for the projects, as well as England, Malta and also Belgium, which began its programme in 2012. In the coming weeks and months eurohandball.com will be looking in more detail at the EHF’s development work around Europe. And in particular at the work being done in the member and associated federations with the support of the EHF. 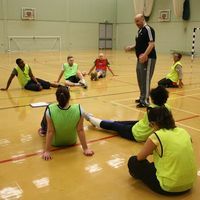 Photo (middle and top left): EHF SMART Project course in England in February 2013 with EHF lecturer, Roman Filz (courtesy of the England Handball Association).